The direct train service between Munich and Zurich takes you south-west to the lakeside town of Lindau from where the train continues through a small section of Austria and into Switzerland routed via St Gallen to Zurich. From an enthusiast point of view the section through to Lindau is hauled by class 218 diesels through some very pleasant scenery. The train reverses at Lindau with an ÖBB electric loco in charge and then continues through the lakeside resort of Bregenz to the border station at St Margarethen. Here Swiss Railways take over with another loco that completes the trip through to Zurich. Photo - A pair of DB class 218 diesels wait departure at Munich Hbf with the 12.34 EuroCity train to Zurich. There are two routes used between Munich and Lindau with one train a day routed via Kempten with the other three services using the less scenic line via Memmingen. 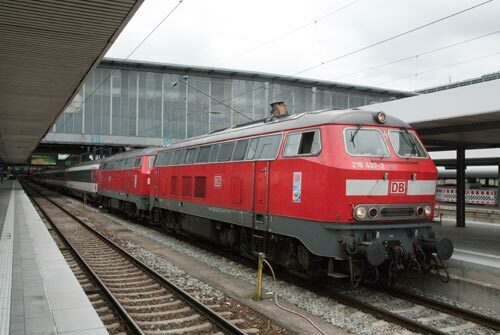 I chose the former and this train (EuroCity 196) departs at 0713 with an arrival in Zurich at 11.44. On arrival just before 6.45 at Munich Hauptbahnhof the train was already waiting in the station formed of Swiss Railways coaches with 218.405 and 218.418 quietly purring at the head of the train. Opting for an advance purchase fare at a cheap price the open coach was entertained for the first section by a man with a rather brusque voice dressed in a shirt and blouse complete with high heels. The presence of a substantial beard added to the scene. The first stop was at Buchloe after which there was a dramatic improvement in the view as we began to thread our way through the mountains of Allgäu. Onion domed churches and green fields noted for their farm produce added to the journey's interest. At times the speed of the train is quite leisurely as the line twists and turns through the landscape with some quite heavy gradients in places. Second stop is Kempten and important railway town with a busy loco depot on the right hand side. After here Customs Officers boarded the train and slowly worked their way through the carriages. Dressed casually with pistols on their hips one poor American couple seemed to be quite worried by this inspection. Outside cows with bells munched the grass as the conductor came round with free chocolate and crisps courtesy of Deutsche Bahn. 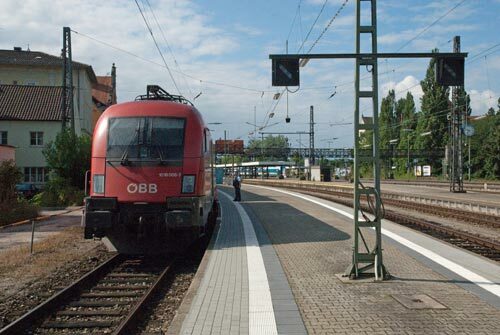 Photo - �BB 1016.006 waits departure from Lindau with a Munich to Zurich EuroCity train. As you approach Lindau you get your first glimpse of Bodensee on the left before crossing a causeway to the station at Lindau where the train reverses direction. Until now the views on each side are about equal but for the next section of the journey it is better to be on the right hand side when facing forwards. After a slick change of locomotives, with ÖBB 1016.006 now in charge, we were soon skirting Bodensee where a number of ferries could be seen crossing this large lake. Nearer to shore smaller boats were out in force as people enjoyed their summer holidays. Next stop was Bregenz after which I was intrigued to see someone with a radio controlled lawn mower in their garden. It looked fun as he sat with a beer in hand guiding the machine over the grass. The railway bears right along the southern shores on Bodensee to reach St. Margarethen with the border crossing just before you enter the station. Here SBB Re 4/4 11144 was waiting to take over and as might be expected for Switzerland the change of locomotive was extremely slick. 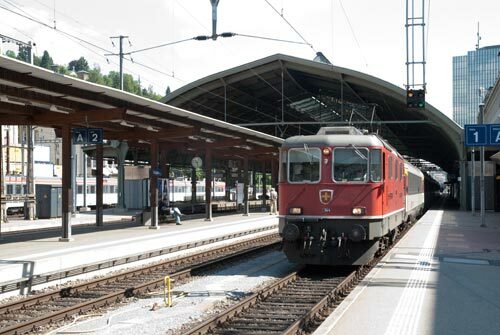 Photo - SBB Re 4/4 no.11144 stands at St Gallen with the 0713 Munich to Zurich EuroCity service. Departing St. Margarethen you head in a more northerly direction gradually losing sight of Bodensee as you progress. St Gallen is the next stop after which the scenery becomes less attractive as you head towards Zurich. Winterthur, the home of the SLM locomotive works (now Stadler?) who built locos that were exported around the world, is the next stop followed soon after by Zurich Airport and Zurich Hauptbahnhof. What you will have noticed by now is that Swiss loco drivers are fast using the 'accelerator' and brakes with some panache approaching platforms at high speed before applying the brakes. Zurich Hauptbahnhof line Munich is what I call a proper station with an overall roof and a sense of arrival. Sadly the journey is over after using the railways of three countries.